Archives of Eaton Bray News for June 2009. This article was published in June 2009. Please see Latest News for more recent information. With only 9 men and batting first, Bray were all out for 49. Harvey hit 24, Roff was 10 not out and not many others troubled the scorers. Jake Barker hit his first run of the season, ensuring that he scored more than his captain Peacock. Mentmore knocked the runs off for the loss of 2 wickets, the highlights being a superb catch above his head at mid on by Jones, and a good throw from Curtis Anthony for a run out. 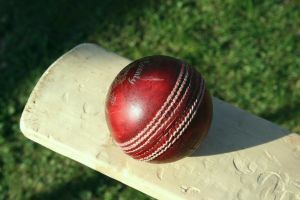 Tea was then taken and a hastily organised Twenty20 match was planned. Mentmore batted first and racked up 146 from their 20 overs. Sayers being the main contributor in making a half century. Tight bowling from Twenty20 specialists Kerins & Flecknell Snr, ensured that the game was still a contest at this stage. Lewis smacked the last ball of the innings to deep mid off, where Jones took a spectacular catch on the run, much to the disbelief of all in attendance. Kerins & Peacock set about the total in fine style, racking up 70 off 8 overs before Peacock was out. The quick loss of Harvey, McDermid and the run out of Jones (still recovering from that running catch) and tight bowling from Sayers, kept Bray in check, but Kerins and Flecknell Snr were still having a go. With 20 needed off 3 overs, Kerins was out stumped for 63 off the impressive Kirchner, and although Roff and Flecknell gave it a good go, helped by some controversial umpiring from Harvey, Bray finished 2 runs short. Some photos from this year's Open Gardens event (14 June) are now available online in the Open Gardens 2009 photo gallery. After being put in the field, Bray gambled by opening the bowling with the spin of Jones against the free hitting and big scoring run machine Lucky Singh. Singh duly smashed a quick fire 20 before launching Jones high into the sky. The ball went up, into orbit, did a loop around Mars before falling into the safe hands of Harvey. New boy Westley caught the other opener on the boundary and when Harvey was presented with a dolly, Simmonds were 52-3 with Jones having claimed all 3, taking his 200th wicket for the club in the process. Jones was then asked if he wanted to bowl out and he said no! With 3 wickets to my name and 2 new batsmen at the crease, you wouldn't have been able to take the ball off me! Runs flowed until Westley bowled a beamer at Gear, and no ball was called. McDermid took the catch anyway, threw the ball into Peacock, who took the bails off with the batsmen standing half way down the wicket believing he was safe due to the no ball!!! When Kerins came on to bowl at the death, Westley remarked that Kerins is not just a keeper. An astute observer that Westley lad. Simmonds ended up with 233. Openers Peacock and Ruff set about the total in fine style, putting on 72 in 10 overs. Ruff was then out for 1. When Peacock was bowled for 77, out of 85, Bray collapsed to 110-6 and the chase was effectively over. But Westley had other ideas. A fine array of attacking shots including switch hits and reverse sweeping, got Simmons panicking. Barker was offering good support until the ball hit his pads, and he decided to go walkabout and was duly run out. I would like to call this piece of cricket braindead, but that would be too kind on Barker. Westley ended on 59 not out as Bray were finally all out for 194. Credit must also be given to the 3 youngsters Charlie, Ryan and Keke who all fielded exceptionally, and brought the average age down to just 23, despite McDermid and Jones playing. On Tuesday, four Parish Councillors visited our School, and had a lengthy tour, encompassing both buildings and grounds. They were impressed by our thriving allotment; newly refurbished pond; bird hide; and wonderful gardens. We have two new additions to our School - Barry and Betty, our sculpture snails, designed and made by Badgers class! If you come along to "Open Gardens", on Sunday 14th June, between 12 o'clock and 5 o'clock, you will be able to meet the snails personally, and experience our immaculate and colourful grounds as you tour our School. We will be serving cream teas too. Look forward to seeing you. It will be a hectic weekend, as our Summer Fayre is on Saturday 13th June, 12 - 2.30pm. come along and experience fun and games; stalls; tasty lunches and many other attractions. Please support us this weekend. We always welcome new faces! The next Parish Council meeting to be held at the Coffee Tavern on Monday 6th July 2009 at 7.30pm. "If we care to think back over the years Where ever have they all gone? Whether one is old or middle aged Time is the same for every one. A year to a month, and then to a week Tomorrow will soon be today, Time is a mystery we can't understand As it flies so swiftly away." So soon this year is halfway gone! Do you ever watch the Time Team on television? As the archaeologists dig and probe into the past, studying the material remains of peoples of long ago. I thought of them as I entered the cathedral at St.Albans City. It stands proud, towering into the sky, and I wondered about all of the artisans who had worked there in centuries past to make that marvellous church a place that spoke of God. Although no human voice at that time was raised to proclaim the faith, everything around me spoke of His glory. This place had for hundreds of years seen people come and go; once it shone with newness, now it showed grandeur. Steps were worn, grooved and shallow in places, where pilgrims and tourists had visited throughout the years of its history. The sun shone through the myriad pieces of stained glass in the lovely windows, casting coloured patterns upon the floor. As I sat for a moment of meditation I became aware of other examples of small, beautiful aspects to delight the eye; crosses, crowns, flowers, worked in wool, the tapestry of the kneeling cushions, for use in times of prayer. The majesty of my surroundings made me feel very insignificant for a time, until I remembered that however many other Christians are "talking" to God, I know that He can hear my words. 1 Peter 3 : 12. "The eyes of the Lord are on the righteous, and His ears are open to their prayers." The thumb is nearest to you - begin by praying for those you love. The index finger is the pointer - pray for those who teach. The next finger is the tallest - pray for those in authority over you. The fourth finger is the weakest - pray for those in trouble. Then comes the little finger - It reminds us of our smallness in relation to God's greatness - ask Him to supply your needs. "You don't need to make a fuss, When you need to pray, You don't stand on ceremony, In any way. You just talk to Him As you would a friend, With only one difference, Amen at the end." We are pleased to report that we now have a website! Check out www.cheekymonkeys.btik.com. Here you will find everything you need to know about us, including a calendar of forthcoming events. You will also find details of the float that we are organising for the village carnival. Our thanks to everyone who continues to support our group - we look forward to welcoming new faces. We need as many mums, dads, carers as possible to keep going! Over the last few weeks the children have been enjoying making cotton wool sheep, sowing cress and mustard seeds and making Easter bonnets and baskets. Another table we have recently introduced is the “nature table”, whereby the children can create a garden picture with leaves, daisies, grasses etc. On June 17th we will be making Fathers' Day cards and presents. A date not to be missed is July 1st, when we will be eating ice-creams with a choice of delicious toppings! If you are a parent or carer and would like to join our friendly group, please come along to Eaton Bray Village Hall on a Wednesday afternoon at 1pm. Everyone is welcome. We charge £1.50 per adult, £1 per child over 1, and 50p per child under 1. Cheeky Monkeys is run by three volunteer parents, Sarah, Louise and Sue. For enquiries please contact anyone of us, or visit our website! Remember - keep coming and we will keep running! Yes as I said last time we re getting ready for the 6th Eaton Bray Beer Festival, assuming you have read Focus early, this will be a great reminder of the event that takes place on Friday 5th June, 6-11pm and Saturday 6th June 12am-11pm. We will have 16 beers and 2 ciders provided by our good friends from CAMRA plus the wine and lager for those who do not do the Real Ale! Obviously we will be doing lots of soft drinks for those that don't imbibe or are driving. There is also entertainment each evening and a children's magician on Saturday afternoon. For full details take a look at, take a look at the Village Hall Events page. You may remember me writing about the successful quiz we held on the 18th April before we had actually had it! This may seem strange but what with deadlines one just cannot avoid it! We made over £1100 which was shared by the Village Hall and Tennis Club with 168 people testing their knowledge against Keith's, our trusted Quiz Master, he came first, but then he did have the answers written down, but a gallant team led by Bernie, the current Chair of the Tennis Club were announced the winners by just one point! Thank you all for coming and thought you might like to know that we have already sold the first table for the next quiz on October 10th! 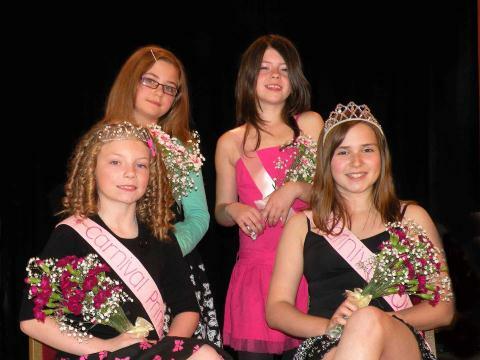 The Carnival Queen, Princess and attendants for this year's Carnival have been chosen! Leading the Procession as Carnival Queen will be 12 year old Charlotte Nilsen, with Carnival Princess Shauna Lugsden, aged 9. Their attendants will be Elise Christie (11) and Rebecca Riley (9). The girls will be looking wonderful, in dresses supplied by Confetti Bridalwear in Tring, their hair styled by High Street Hair and carrying beautiful flower posies from Buds of May. a demonstration by Maggie Stern of Spinners and Dyers. Perennial favourites the Dog Show and the Classic Vehicle display will be back, as will that Carnival favourite Clarabelle the Cow - see if you can guess the square of the Green where she'll drop her pat! For radio amateurs, visit the Radio Hams, to see how it's done! For everyone there is free admission, free entertainment and free parking! We still need offers of help for the day itself. Could you man a stall for a few hours, join the heavy gang at the beginning or end of the day or could you make cakes for the tea tent or the cake stall? For any of the above please leave a message on our website - www.stmarysvillagecarnival.com. We're all looking forward to 4th July - hope to see you there! Don't forget our annual Play Tennis Day, which we're holding as part of the National Lawn Tennis Association's 'Play Tennis' days. It's on Saturday 20th June at the courts from 12.00am to 3pm. This is a free tennis taster session for both adults and children, members and nonmembers, so you can bring along as many friends and family as you can muster; we'll have spectacular offers available for any new members joining on the day! The recent blue skies have encouraged our fair weather players back onto the courts for our social tennis sessions on Sunday mornings and Tuesday evenings. In fact our Tuesday evening session has been extended to run from 6pm to 9pm, so that those who may work late still have the opportunity to come along. Last Sunday morning was a good example as 15 finely honed athletes demonstrated their skills, competitiveness and amazing fitness levels. Then I switched off the rugby, and went down to the courts for some tennis to join a dozen somewhat different looking individuals, but nonetheless equally enjoying a gentle run-around in the sun and hitting a few balls now and then, when one fortuously went anywhere near a racquet. My best effort was a thunderbolt of a backhand that headed straight for the tramlines; unfortunately they were those in Birmingham rather than on the courts. Then I was aced by membership secretary Jon Moon; thinking back I'd had time to make a cup of tea whilst that ball went past me but I still missed it. I made a mental note to work on my reflexes. Well, work on them when I get some. The summer South Beds league season has started with, I think it's fair to say, mixed results so far. Whilst our Ladies team is performing admirably, the team I represent, the infamous Men's D team, has been less fortunate. Our last outing was to Flitwick and Ampthill where the highlight of the evening was a spectacular tea of crusty baguettes, ham, cheese, pasta salad, coleslaw and tomatoes, all consumed in their clubhouse in the company of their adopted cat 'Hoop'. It certainly made up for our performance on court, where we didn't unduly trouble the scorers. Team captain Glenn Wigley is a great motivator however, and told us we'd all played to the very best of our abilities. Which unfortunately weren't good enough and so we're all dropped. Well that's what I think he really meant, but he was very nice about it. I look forward to my next callup and promise to do better next time. I really must focus on the tennis part of the evenings, rather than spend my time on court trying to lose as quickly as possible so I can get to the after-match tea and choose the largest piece of baguette. For any further information about the club, including when we get together for our social tennis sessions up at the School Lane courts, or our various activities, you can visit our website at www.ebltc.org.uk; alternatively contact Bernadette Hillman, Coach Nick Boys, or if they're all out and I'm not having an argument with a gazebo, me, Andy Cross. Skipper Peacock lost the toss and was unsurprisingly asked to field on a hot day. His first decision was who to omit from the 12 players available. Jones was duly selected to stand down, to ensure that he didn't give anymore shocking lbw decisions, which Barker Snr was still moaning about. Tidy bowling from all concerned restricted RR to an achievable 169 with Barker Snr, Martell, Kerins, Roff, the impressive Tickell and the veteran Molyneux sharing the wickets. McDermid made a career best 19 but the early loss of Norris and Peacock meant the chase was always going to be tough. Umpire Martell continued the poor umpiring trend, when giving Peacock out lbw. When asked about the decision, Martell said he only gave it "Because I thought you were walking anyway!" Hing and Kerins got themselves in, and out, and the chase fell apart. It was left to youngsters Tickell and Roff to ensure Bray were not bowled out, ending 121 for 8. The players who umpire need to take some lessons from our umpire professionals, 1st team umpire Martin Quinn and 2nd team umpire John Smith. Quinn is known as the fastest finger in the UK whilst Smith called a wide and declared over! Coaching courses anyone?! You are viewing the June 2009 archive.